Ever since I made gnocchi that first time, I’ve been in love with it. Little pillows of heavenly perfection. Potato gnocchi is really easy to make. The mixture is dryer, it forms together nicely and you can easily add more liquid if its too dry that you can’t roll the mixture into logs. Pumpkin gnocchi is the complete opposite. There is so much liquid and moisture in the pumpkin puree that you feel like you could add a 5 pound bag of flour and it still wouldn’t be enough. I assumed that ricotta gnocchi would be similar to pumpkin and would be quite the hassle to make. For most people, that’d be a deterrent. For me, it’s a challenge. I was pleasantly surprised to find that while it was not as easy as potato gnocchi it was no where near as difficult as pumpkin gnocchi. 1. In a medium bowl, stir together the ricotta cheese, eggs, Parmesan cheese and salt. Add in the flour 1/4 cup at a time until it reaches a manageable consistency. You want it to be soft enough to handle but not too moist that you won’t be able to roll it. 2. Lightly flour a surface and turn dough out on it. Divide the dough into 4 pieces. Return 3 pieces to the bowl and cover with a dish towel until needed. 3. Roll out the dough into a long rope about 2 inches thick. Slice into 1 inch pieces. Place on a parchment-lined baking sheet. 5. Begin the vodka cream sauce by combining the crushed tomatoes and salt together in a large saucepan. Bring to a boil, then reduce the heat and allow to simmer for 25 minutes. 6. Bring a large pot of salted water to a boil. Use a slotted spoon to drop in the gnocchi. Once the gnocchi have floated to the top, remove with the spoon and return to the baking sheet. 7. Add the heavy cream and vodka to the saucepan of tomatoes. 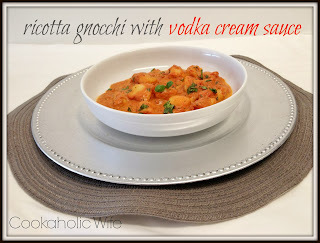 Bring to a boil again, then add in the cooked gnocchi and toss to coat. Cook for 1 minute more. 8. Plate, garnished with fresh basil. This is probably the best combination of two recipes I’ve ever put together. I actually doubled this recipe and have some in the freezer just waiting to be made again for dinner one night.